Students experience all kinds of new adventures in college. Parties, concerts, tailgating, and other campus events provide fun, safe opportunities for students to enjoy time together. These activities may or may not include alcohol. Some schools have liberal alcohol policies, and they may even have bars on campus, which give students a place to wind down and socialize. College towns often offer bars, pubs, and breweries, adding to an overall party feel for students. The social scene at any college or university helps define the school's atmosphere and the overall student experience. Many schools are known for their parties, whether they are in a rural setting with a high number of bars per capita or located in an urban environment with a thriving nightlife. By embracing a "party school" reputation, colleges and universities can incorporate that reputation as part of what they have to offer students. 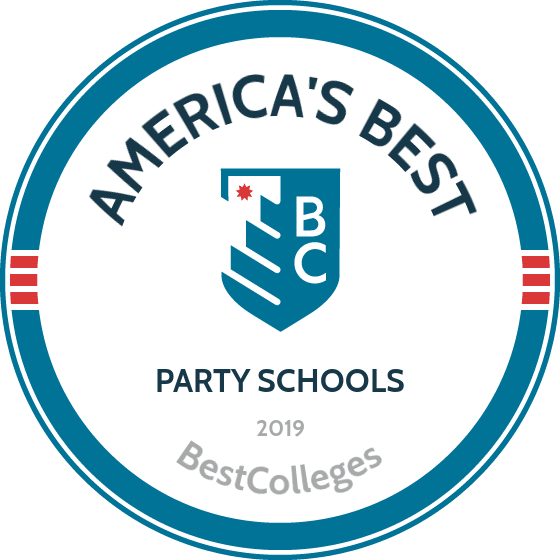 The best party schools give students a chance to work, study, and play responsibly. Located in New Orleans, Louisiana, Tulane University benefits from the weather, food, and culture of the historic city. A private research university, Tulane embraces its traditions and those of New Orleans, providing students with numerous events and celebrations throughout the year. Students can take part in Crawfest, an annual music, food, and arts festival; cry out the Hullabaloo Cheer at sporting events; and enjoy one last wave with music, food, and family before graduation. Campus life at Tulane includes concerts, parties, and tailgating at football games each fall. During Mardi Gras festivities, students can watch the Tulane Marching Band in the parade, drink, throw beads, and celebrate one of the world's most famous carnival events. Tulane University has no bars on campus, but the restaurants, clubs, bars, and other venues that surround the school provide plenty of access to alcohol. The Boot, a student bar in New Orleans, was voted the best college bar in 2013. Founded in 1743, the University of Delaware offers rigorous academic programs to about 25,000 students each year. Located in Newark, Delaware, the university is an unlikely party spot. Students enjoy an active nightlife and social scene. Students have access to several bars, taverns, and restaurants within walking distance of campus and can participate in numerous sporting events, concerts, and on-campus activities. Sponsored by two local bars, The Barn in Delaware Stadium serves beer and provides a tailgating area for students and fans. Students can spend hours in The Cockpit, listening to music and partying before the athletic event. Greek life at the University of Delaware includes regular house parties, and St. Patrick's Day celebrations dominate the campus. The school promotes Shamrockfest and celebrates community service on the holiday. Near downtown Athens, the University of Georgia includes 17 schools and colleges that encourage academic excellence and research innovation. Downtown Athens provides plenty of bars, pubs, and restaurants for UGA students, and extensions of UGA's website offer guides to the best establishments in the area. UGA boasts a large number of fraternities and sororities, which promote leadership and diversity and are known for their tailgating and parties. UGA has a strong football tradition, and students participate in elaborate tailgating events. Tailgating at UGA involves an all-day party with music, alcohol, and food. Games between the Georgia Bulldogs and their rivals, the Florida Gators, take place at a neutral site in Jacksonville, Florida, and were long known as "The World's Largest Cocktail Party." West Virginia University in Morgantown was founded in 1867 as a public land-grant institution. Although WVU has several campuses throughout the state, Morgantown students have exceptional celebratory spirit. Morgantown's nightlife and bar community provides numerous opportunities to drink and have fun. For example, a bar called The Back Door is located across the street from the university library. WVU students demonstrate their school spirit through their dedication to football, tailgating, and couch-burning. WVU football fans enjoy hours of tailgating on game day and go to great lengths to demonstrate their school spirit. Student excitement for football games and excessive drinking led to the development of a couch-burning tradition that Morgantown authorities have been working to stop for almost a decade. The party atmosphere at WVU also includes concerts, elaborate St. Patrick's Day celebrations, and an athletics-sponsored happy hour. Located on Lakes Monona and Mendota, the UW was founded in 1848 and is one of the leading research institutions in the world. The UW has a bar, Der Rathskeller, in the student union, and the campus straddles State Street, a pedestrian mall with shops, restaurants, and plenty of bars. Students at the UW can also hang out on the Memorial Union Terrace and enjoy a beer, live music, and a breeze off the lake. The first Saturday in May, thousands participate in the Mifflin Street block party, which shuts down the street. Partiers drink beer and enjoy the end of a long Wisconsin winter. The UW students also enjoy tailgating, Greek life, and events like Madison's annual Brat Fest. Fewer than 4,000 students attend Bucknell University in Lewisburg, Pennsylvania, but the number of house parties at the school created the tradition of House Party Weekend. When Bucknell University's administration cancelled House Party Weekend in 2013, students continued with the celebrations, merely moving them off campus. House Party Weekend lives on but has been scaled back from what it once was. Students at Bucknell University, especially fraternity and sorority members, provide house parties for the student body. The school and the town create a nonstop party environment in Lewisburg, with food trucks like the Flying Bison providing meals until 3 a.m. on weekends. Students can also participate in karaoke, student organization meetings, and campus community events at Uptown, an on-campus facility that allows alcohol. Based in Bethlehem, Pennsylvania, Lehigh University has about 5,000 undergraduate students and a reputation for parties. There are 25 fraternity and sorority houses on the university's campus, which may contribute to the number of parties and the number of drinking citations issued each year. The strong Greek presence of Greek life on Lehigh's campus has led to an increased police presence. Students enjoy themselves at Lehigh, whether or not they participate in fraternity or sorority events. They can tailgate at the school's football games each fall or visit one of the many bars near campus. Bethlehem offers five bars a short distance from Lehigh, and cocktails are available at nearby restaurants. Student organizations can also hold on-campus events with alcohol, as long as they follow the university's regulations and social policy guidelines. The University of Texas at Austin is located in one of the state's most vibrant and culturally rich cities. UT students celebrate and party on football game days. Each spring, the university hosts RoundUp, which includes music, food, and drinks for the Austin community and UT students and is usually accompanied by additional parties on campus. Austin's thriving music scene provides students with plenty of concerts to attend, and local music venues offer various types of entertainment. Each weekend, Sixth Street in downtown Austin is blocked off for a street party, during which students can visit bars, pubs, and craft breweries without paying cover charges. Rainey Street features former homes that have been converted to lounges, bars, and beer gardens. Florida State University provides events, games, and movies for students to enjoy. Students also take advantage of the thriving Tallahassee nightlife. Bullwinkle's, a bar situated on the Tallahassee Strip, offers drink specials, music, and a tiki bar four days a week, while nightclubs like TENN give students a chance to dance. For a quieter, cheaper option, students can visit Poor Paul's Pourhouse or Potbelly's. Student organizations, including FSU's 54 fraternities and sororities, can provide alcohol at on-campus events and activities with university permission. Tailgating kicks off with late-night sessions prior to the first game of the year, and official Seminole tailgating includes celebration, alcohol, and music. The party culture at the University of California Santa Barbara in the Isla Vista community prompted the creation of committee to work for a cooperative and collegial relationship between the school, its students, and long-term residents of the area. The Life of the Party group at UC Santa Barbara promotes responsible alcohol consumption and provides information to students. Parties, activities, and events at Isla Vista include dodgeball tournaments, yoga and trivia nights, and Halloween festivities. The party atmosphere at UC Santa Barbara also includes events like Deltopia, a weekend-long street party for locals only. The party, which takes place on Del Playa Drive in Isla Vista, is not sanctioned by the school, but student attendance remains consistent. Students can also hang out at bars in downtown Santa Barbara or near campus, visit The Loft, or see concerts at the UC San Diego Box Office. Located in Iowa City, the University of Iowa leads the country in research and offers students a welcoming, vibrant experience. Downtown Iowa City features a pedestrian mall with bars and restaurants, most of which participate in the city's block party and Taste of Iowa City event each summer. The university hosts an annual kick-off event for students that includes a weekend full of entertainment and festivities. The Hawkeyes demonstrate their party spirit during Big Ten sporting events. Football tailgating before games at Kinnick Field includes all-you-can-eat buffets with beer and barbeque. Students enjoy games from the the Hawk's Nest, an student-dominated area that extends to all sporting events. Students can drink alcohol on campus if they follow university policies. With more than 400 student clubs and organizations, the University of Colorado Boulder emphasizes community and innovation. In addition to maintaining an active Greek life, UC Boulder provides late-night entertainment for students at Buffalo Nites and kicks off each fall with Fall Fest at the University Memorial Center. Students have fun on The Hill, an area next to campus with bars, theaters, clubs, and restaurants. The most popular spots to visit include the Sink, a burger and pizza joint with drink specials all day on Sundays. Students can also spend time at the Pearl Street pedestrian mall in downtown Boulder. Bars like Pearl Street Pub and Cellar provides happy hours, outdoor drinking, and live music each week. With more than twenty breweries, distilleries, and wineries, Boulder offers numerous festivals and alcohol events each year. The University of Illinois at Urbana-Champaign has more than 650 buildings on campus, including numerous bars. On Green Street are student favorites like Murphy's Pub and Legends. The legal age to enter a bar is 19 in Champaign and 18 in Urbana, giving students access to the active nightlife without legally being allowed to drink. The university has more than 1,000 student organizations, which offer events and festivities for students. Students can learn about activities and opportunities to socialize at Quad Day each fall. The university's strong fraternity and sorority presence results in plenty of parties and events with alcohol, music, and entertainment. Students at the Big Ten school take sporting events seriously, and the party atmosphere on football game days includes body-painting traditions, tailgating, and participation in the Illini Pride student section. Founded in 1819 in Hamilton, New York, Colgate University has fewer than 3,000 students on its small campus. With an average class size of 17 students, students at Colgate University get to know each other inside and outside of the classroom. Colgate offers an active campus life with student events, Greek life functions, and volunteer opportunities. The party atmosphere gives students a chance to play as hard as they work. Almost one-third of students are involved in a fraternity or sorority. Many of Hamilton's bars sit near campus, on Lebanon Street. Venues like Rusch's Bar and Grill and the Risky Business Cafe give students opportunities to enjoy alcohol and good times with friends. Former Colgate student Jay Chandrasekhar and the members of his comedy group, Broken Lizard, credit the school's party culture as contributing to their success. Providence College in Rhode Island offers more than 50 areas of study to about 5,000 students. Residence halls exclusively for upperclass students, such as Suites Hall, give students a chance to live in apartment-like settings. Each year, PC students host the Front Nine, a golf-themed party that includes hundreds to thousands of students who begin drinking as early as 6:30 in the morning. The student association organizes a concert each spring, during which attendees can enjoy music, alcohol, and dancing. The annual Friar Ball brings together students to eat, drink, and party in a regulated campus setting. Students can visit Eaton Street, where house parties take place each weekend. Local bar The Abbey provides nearly 100 beers, along with featured cocktails. Indiana University Bloomington has more than 750 student organizations and more than 70 fraternities and sororities. Students enjoy Hoosier traditions like welcome week and homecoming, annual events with party atmospheres. Each year, IU hosts the Little 500, a bike race with thousands in attendance. During the annual Dance Marathon, students dance all weekend for a good cause. IU students and fans take tailgating seriously during football season and spread the festivities across campus. Memorial Stadium does not sell beer, but the school may change that policy. Basketball season at IU offers students more opportunities for parties than football season. Assembly Hall, renamed Simon Skjodt Assembly Hall in 2016, has one of the largest student sections in the country. Bars in Bloomington, such as Kilroys Sports and Brothers, cater to students on game days and throughout the year, offering happy hours and late-night entertainment. Syracuse University was founded in central New York in 1870. The private institution is known for strong academics and research, along with a reputation for partying. Students can tailgate at a Syracuse football game or become a member of Otto's Army at a basketball game in the Carrier Dome. Each spring, Syracuse hosts Mayfest, an all-day event featuring food, drink, and entertainment. Alcoholic beverages include beer, apple cider, and wine slushies. Each year, Syracuse holds Jam Juice, a concert at the university union. Castle Court on Syracuse's campus hosts several parties each year, including a Cinco de Mayo event and impromptu block parties during March Madness. Students can also visit the many bars in Syracuse, including Faegan's, which offers "beer tours" every Tuesday night. Tours include multiple beer selections from around the world. With 15 academic divisions, the University of Mississippi is the largest institution of higher education in the state. Located in Oxford, Ole Miss has a strong football and tailgating tradition. Parties take place in the Grove on campus before home football games. Tailgating at Ole Miss has a unique feel, and gatherings tend to resemble an old-fashioned Southern cocktail party. Instead of beer, many tailgaters drink bourbon, Bloody Marys, and mimosas. The strong fraternity and sorority presence at Ole Miss offers students numerous opportunities to party. Each spring, campus groups host themed parties, with costumes and alcohol. Oxford has numerous bars for students to enjoy. The Blind Pig and The Levee, for example, offer happy hours, late-night food, and entertainment. The state's oldest public university, the University of Alabama in Tuscaloosa has a reputation for providing students with a good time. The annual welcome party sets a festive tone for incoming freshmen and returning students and includes food and music. More than 11,500 students participate in Greek life at the university, which provides access to parties and alcohol. Crimson Tide athletic events include elaborate tailgating and partying. Football games attract thousands of fans and students, who enjoy beer, food, and music. The school also offers an area for family-friendly pregaming. Tailgating also includes the long-held traditions the Elephant Stomp and the Walk of Champions. Tuscaloosa has a thriving bar scene, and the University of Alabama campus is adjacent to downtown and the Strip. Students can visit the Houndstooth Sports Bar, self-proclaimed as Alabama's favorite college bar. The University of Maine in Orono offers numerous outdoor and recreational activities. With more than 11,000 students, UMaine recently became known for its party atmosphere. Students can participate in fraternity and sorority life and campus activities. Students can also celebrate Maine Day or visit the Bear Brew Pub, which offers snow day specials when the university cancels classes. Students can also enjoy The Roost and Woodman's Bar and Grill. Students living at The Reserve, previously known as The Grove, throw numerous house parties throughout the year. The apartment complex gained a reputation for out-of-hand parties, including events during which students jumped off the roof. All on-campus events with alcohol require police presence. Southern Methodist University in Dallas, Texas, was founded by the Methodist Church in 1911. Students benefit from the city's active nightlife and large number of bars. The University Park area of Dallas, home to SMU, includes favorite venues like the Barley House and the Trinity Hall Irish Pub, which each offer alcohol, music, and game nights. The Greenville area provides SMU students with more options. Students can attend fraternity and sorority parties and tailgate at SMU football games. In 2012, the size of SMU's parties led the university to cap the number of people who could attend. The school's football stadium, named for Gerald Ford, sells beer, as does the basketball arena, Moody Coliseum. Students at the University of Rhode Island benefit from the school's proximity to the state's beaches, communities like Narragansett, and major East Coast cities. Students on the Kingston campus have access to numerous university-sponsored outings, in addition to on-campus sporting events and concerts. In addition to tailgating, students can join the aptly named Rhody Ruckus to take part in special activities. The Rhody Pub at the Ryan Center serves beer, and the university has 24 fraternity and sorority groups. Bars near campus host college nights, providing students with opportunities for affordable, responsible drinking. The Mews Tavern has nearly 70 beers on tap, and the Last Resort in nearby Smithfield provides live music multiple times a week. Pennsylvania State University in University Park has a party atmosphere, especially during the football season. Thousands of fans and students enjoy beer and music while tailgating before and during Penn State football games. With the exception of freshmen, most of Penn State's undergraduate population live off campus. Students and Greek organizations hold house parties, although the school has begun monitoring these activities more closely. Each year, the Student Programming Association hosts the Nittany Block Party, which features numerous performers and activities. College bars like the All-American Rathskeller have provided the Penn State community with food and beer since the 1930s. Other local favorites include Zeno's Pub and the Liberty Craft House. Zeno's holds beer festivals and offers live music, while the Liberty Craft House has nearly 50 beers on tap. Each year, Michigan State University in East Lansing hosts the Spartan Remix, a festival of art, music, and culture, to start the academic year on a celebratory note. Students can party during on-campus concerts and sporting events, while tailgating and game-day traditions usher students into the MSU community. Campus clubs hold themed parties at local bars, including Sparty Bar Mitzvah and Sparty Gras presented by MSU's Hillel Center. MSU's active Greek life provides students with opportunities to socialize and party. Celebrations like Cedarfest, started in the 1970s and banned by authorities in 1987, brought out thousands of party-goers twice a year. Given the strong party presence, MSU and the city of East Lansing teamed up to provide students with party guidelines to prevent out-of-hand celebrating and to encourage students to drink responsibly. Students at the University of Florida enjoy Gainesville's downtown and midtown areas. Bars, restaurants, and nightclubs throughout Gainesville provide nightly opportunities to party. The Grog House Bar and Grill offers drink specials, while Simon's provides music and dancing. Students can also participate in the annual Gator Stompin' pub crawl, which includes more than 80 bars and pubs. On campus, fraternities and sororities throw house parties on weekends, and thousands of fans celebrate during football tailgating every Saturday. As part of what used to be called the "World's Largest Cocktail Party," UF tailgaters visit Jacksonville each year to support the football team as they play Georgia. The university also holds the Gator Growl during homecoming, an event that features concerts, festival activities, a parade, and pregame tailgating. The number of bars on campus and in a college town factor heavily into a school's reputation for partying. Schools in cities have proximity to more bars, clubs, and restaurants that cater to students in search of a good time. Colleges and universities in smaller towns or rural settings may offer fewer establishments for partying. Schools that offer tailgating, allow alcohol at sporting events, and organize large social activities are often known as party schools.